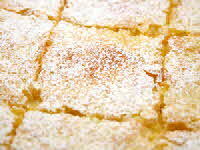 If your sweetheart likes lemon, these are very nice lemon bar cookies. This is a comfortable old recipe. We’ve had it around for a long time. We found its predecessor in an old Farm Journal Cookbook. This version is built around a single lemon. We think it's just lemony enough. Give this easy recipe a try. 1. Mix the two cups flour and 3/4 cups powdered sugar together in a medium bowl. With a pastry knife, cut in the butter until granular. Press the crumbs evenly into the bottom of an ungreased 8 x 13-inch baking pan. Bake for 10 to 12 minutes or until golden brown. Set aside to cool. 2. In your medium bowl, mix the granulated sugar, 1/4 cup flour, and baking powder. Add the eggs, zest, and lemon juice. Mix with a spatula until smooth. 3. Pour the lemon filling over the crust. Bake for 35 minutes or until the top starts to brown. Remove from the oven and let cool. Use a mini-strainer or sifter to dust the top with powdered sugar. Cut into squares. Baker’s tip: Once chilled, buttery crusts can stick to the pan making it hard to remove the bars intact. Heat up a wet cloth in the microwave and place the pan on the hot cloth. The heat will soften the butter on the bottom and make removal much easier.